Opening Friday April 23, 5p.m. The Interdisciplinary Arts Department is proud to announce its 2010 Thesis Exhibition, featuring the work of 14 thesis candidates from the two MFA programs in the department. The show will run from April 23 through May 15, 2010 with performances on select afternoons and evenings, detailed below. This exhibition features the work of Sara Andrews, Suzanne Bartelson, Heather Bella, Kristina Gosh, Ramah Jihan, Shalaka Kulkarni, Susan Kwon, Stephanie Lupu, Victoria Malone, Teresa Pankratz, Kelly Parsell, Devin Schuyler, Tamale Sepp and Kevin Valentine. 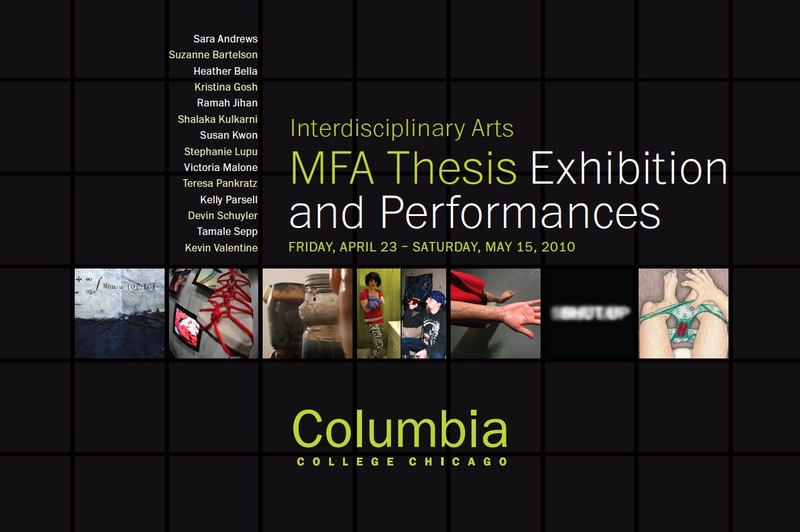 The 2009 Thesis Exhibition will be presented in two locations on the Columbia College Campus: the galleries at the Center for Book and Paper Arts, 1104 S. Wabash, 2nd floor, and the Arcade Gallery, 618 S. Michigan Ave, 2nd Floor. Ten installation works, a reading room, a screening room, and two theater-based performances will comprise the show. Theater performances will take place the opening weekend of the exhibition at the Stage Two Center, 618 S. Michigan Ave, 2nd Floor (theater). Manifest Opening: Friday, May 14, 11 a.m. to 9 p.m. Reception for the artists: 4 p.m. to 7 p.m.
2nd Floor, 618 S. Michigan Ave.
Mon-Fri, 10 a.m.-5 p.m.; Sat 12 p.m.-5 p.m.
Mon-Fri, 10 a.m.-6 p.m.; Sat, 12 p.m.-5 p.m.
2nd Floor Theater, 618 S. Michigan Ave.
Thursday, April 22, 2p.m. and 7 p.m.
Saturday, April 24, 3 p.m. Previous Article New Yanomami Photo Gallery on FACEBOOK!